NASA says its Voyager 2 probe has become the second human-made object to fly into interstellar space — six years after its twin, Voyager 1, became the first. 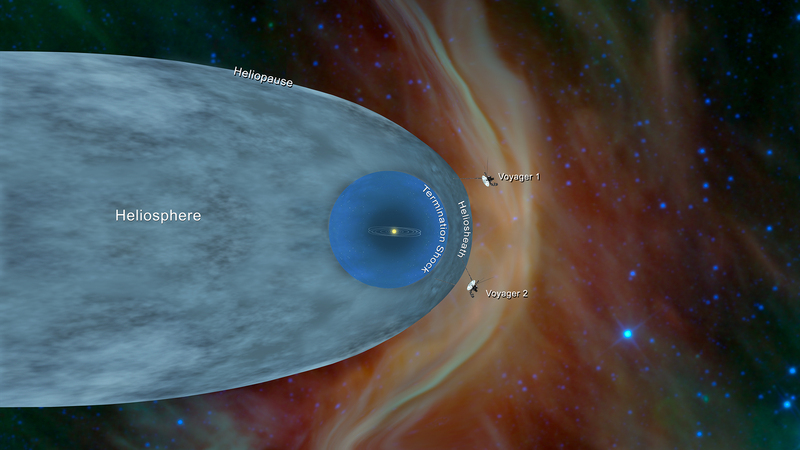 Based on readings from its onboard instruments, the mission’s scientists have determined that Voyager 2 has left the solar system’s heliosphere, a protective bubble of particles and magnetic fields created by the sun. The spacecraft is now journeying in a region where the cold, dense interstellar medium takes the place of the tenuous, hot solar wind — more than 11 billion miles from Earth. The milestone came more than 41 years after Voyager 2’s launch in 1977 on what was then a grand interplanetary mission, and is now a grand interstellar mission. During the 1970s and 1980s, Voyager 2 took on a “Grand Tour” with close flybys of Jupiter, Saturn, Uranus and Neptune, while Voyager 1 took a different course that featured a close-up of the Saturnian moon Titan. Scientists discussed the mission’s status today in conjunction with this week’s American Geophysical Union meeting in Washington, D.C. This entry was posted in GeekWire and tagged AGU, Interstellar Flight, NASA, Space, Voyager. Bookmark the permalink.